Reflection is a therapeutic activity to do periodically. Think of it as a tune up for the soul. Where am I going? What is my goal or purpose? How am I living my life? Are my steps heading in the right direction? Am I aware of all my blessings? These are all good questions to ask oneself. It is good to take a time out and reflect. I am grateful for my urge to do so. We live near a lake and creeks which offer beautiful reflections. This image was quickly taken with a cell phone to illustrate the concept that was in my heart today. 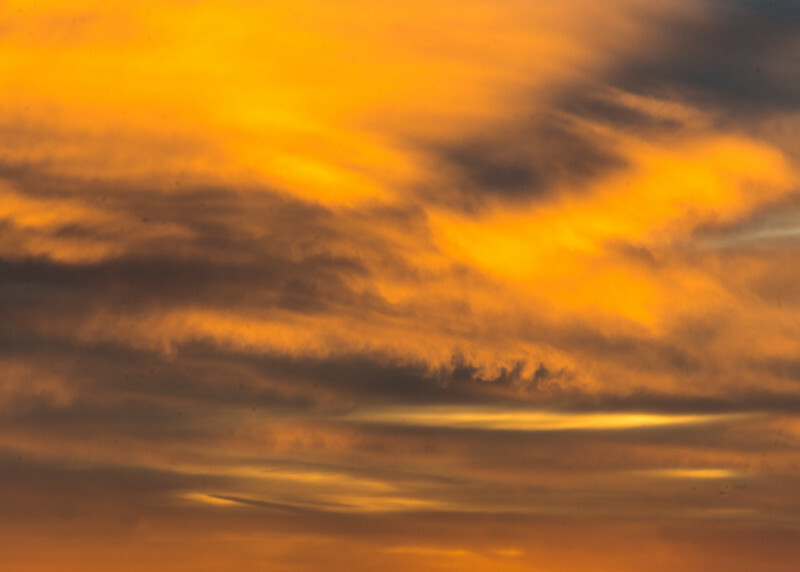 Clouds add beauty and contrast to sunrises and sunsets and add texture to the sky. They add a painter’s touch to the canvas above. Clouds also add humidity to the air and cool the heat of the bright sun. They are enjoyable to observe as they float across the sky ever-changing with the air currents of upper atmosphere. Often it is relaxing to lay back and watch the clouds overhead and notice or name the shapes they make. This morning this image was a part of a beautiful beginning of the day. Vivid and vibrant sunrises can be the best devotion there is. It was with gratitude and appreciation that we enjoyed this beauty and peace this morning. An early morning and restless spirit led to reading beautiful poetry. Timeless phrases from gifted poets have a way of opening the mind’s eye to gratitude for things taken for granted or assumed. The beauty of words can unleash moments of recognition on just how beautiful life, simple necessities to live, can be. My heart is filled with gratitude for these talented poets who paint such beauty with their words. Nature, just like poetry offers subtle beauty that can be missed by a quick pace. This image came from just such a moment. 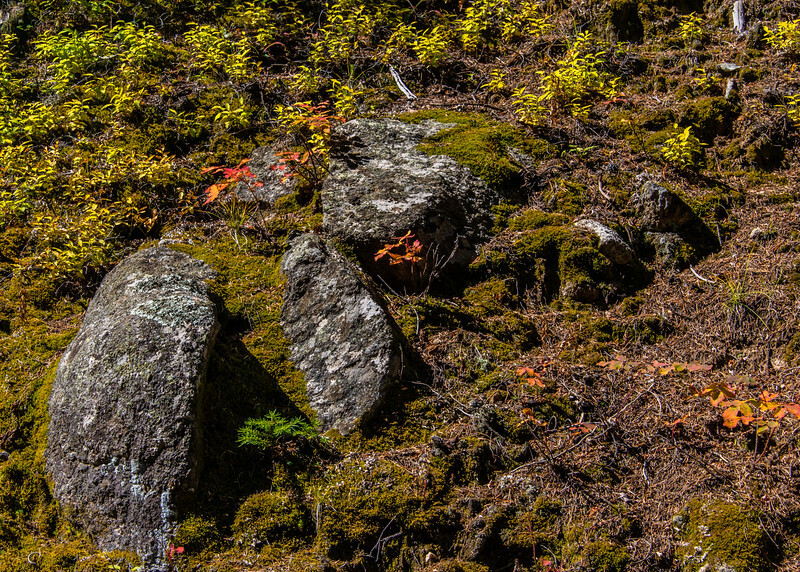 The orange and brown of the soon-to-be dormant plants with the vivid green of new life of the pine caught my eye and paused our step on a beautiful day of hiking. This loveliness could easily have been missed if our steps had been in haste. Have you ever noticed the rich earthy smell when you walk in a forest lush with trees and ferns? This happened recently on a visit to the Pacific Northwest forests, where the tall wide trees become nurse logs to their seedlings after they fall and and go on to provide years of water and nutrients as they slowly decay. The wood from the fallen tree is fibrous and provides an anchor for the seedling. Several decades later the fallen tree is reduced to rich fragments. The scent was wonderful. It was a gift to see nature at work. The life in this area was abundant. Nature left to its own does do amazing things. 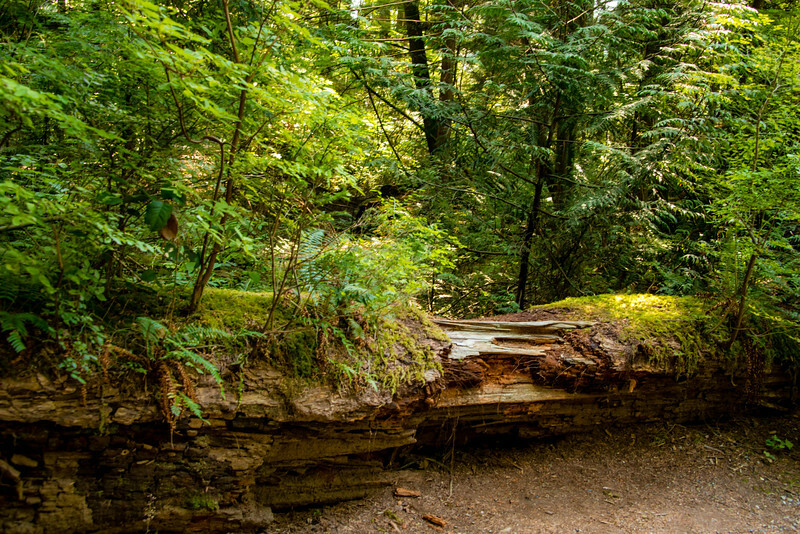 This nurse log was in a public park near Vancouver. It could have easily been overlooked in passing, so it was all the more special to see such a unique display of life. It reminded me of a terrarium without the container. I do not remember, how old this log was, but it certainly has many years left to provide nutrients to the plants growing from it. To experience this delight of nature was a poetic experience. A person’s outlook or attitude on life is fundamental to every aspect of his or her life. One’s perspective or outlook plays a huge role in quality of life and general health. Before planting the feet on the floor in the morning, a choice can be made as to how to approach the day. Will it be faced with a positive or negative perspective? How can I help you, or will it be what can you do for me? Norman Vincent Peale’s books have been in our home for more than 20 years. He is the one of the earlier people whose focus was on a positive outlook. Spending a few minutes with him can be uplifting and encouraging. I am grateful for the simple truth of his work. 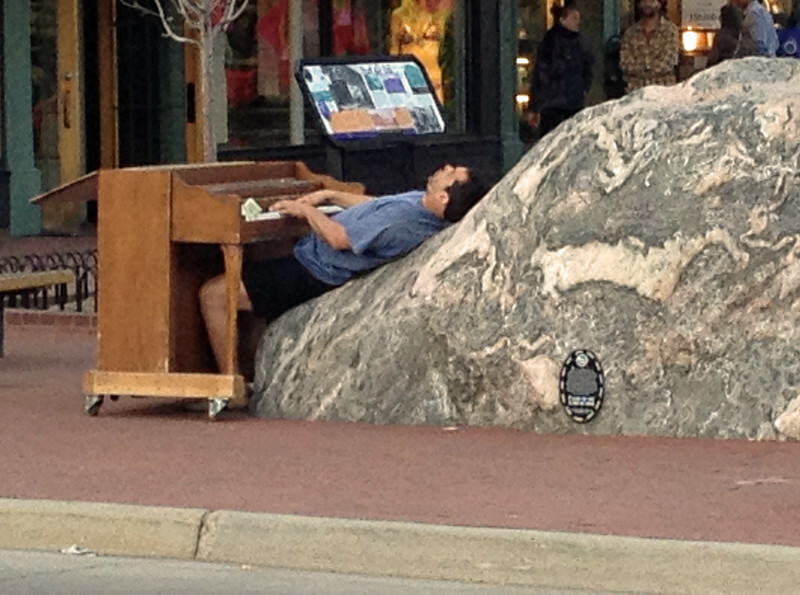 This is a fun image that was quickly taken with a cell phone on Pearl Street mall in Boulder. Despite its poor quality it conveys a unique quality of perspective. The young man saw a need for his touch. He provided a smile and a glimpse of life from another perspective. Anxiety, fear and worry are destructive feelings that have a way of absorbing your thoughts and wasting time. Calm, assurance, solace are antonyms of the previous trio of time snatchers. These negative feelings also are harmful to the body often triggering chronic illness or disease. As a young mother, I was a worry queen. Little did I realize that the chances of my worst fears happening were minuscule. Thankfully and gratefully feelings of worry have been put in their place with a fair amount of calm. Ever so often that knee jerk reaction of fear, worry, or anxiety acts up, and it shows me there is still work to do to keep the peace. With the impact of Ebola and Enterovirus it is easy to go to a place of fear and worry. These are troubling and puzzling viruses. But here again worry will not help in the least to deal with these viruses. Our continued prayers are needed for these viruses and everyone who has been affected. Resources are needed to treat Ebola especially in the underserved and poor areas where it is prevalent; also knowledge for best diagnosing and treating by health care workers across the world is important. Like every other anxiety or fear, prayer has a way of smoothing the raw edges of fear or worry so it is more manageable. For an image of anxiety, fear, or worry I looked to my own fears. 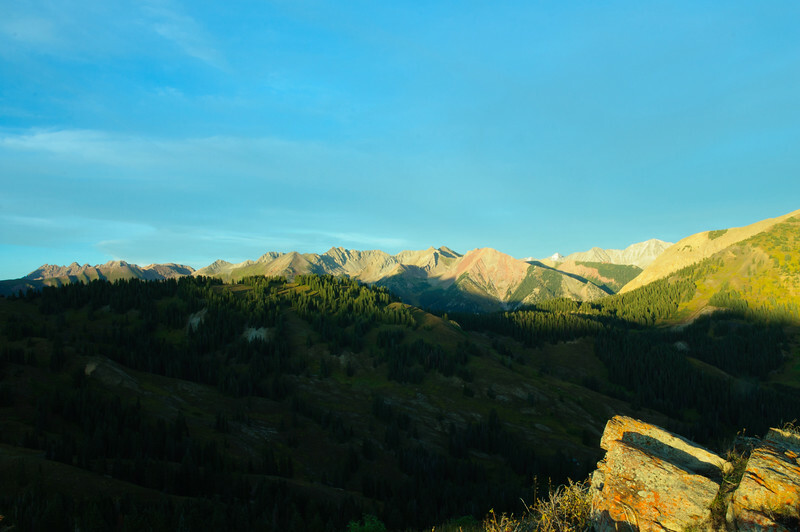 This image is from what the locals in Crested Butte refer to as, Top of the World. It sits directly across, with front row seats of the Maroon Peaks. In my younger days heights were not pleasant with the butterflies they caused in my stomach along with weakness in my knees. But with the years, an enjoyment of hiking eased away these fears and now this fear rarely shows its face. Although this was a simple fear to face, I am grateful for the practice it gave me to face the more serious ones. At times fears and worries seem too real, but it is good to remember these are poorly equipped to deal with a challenge. 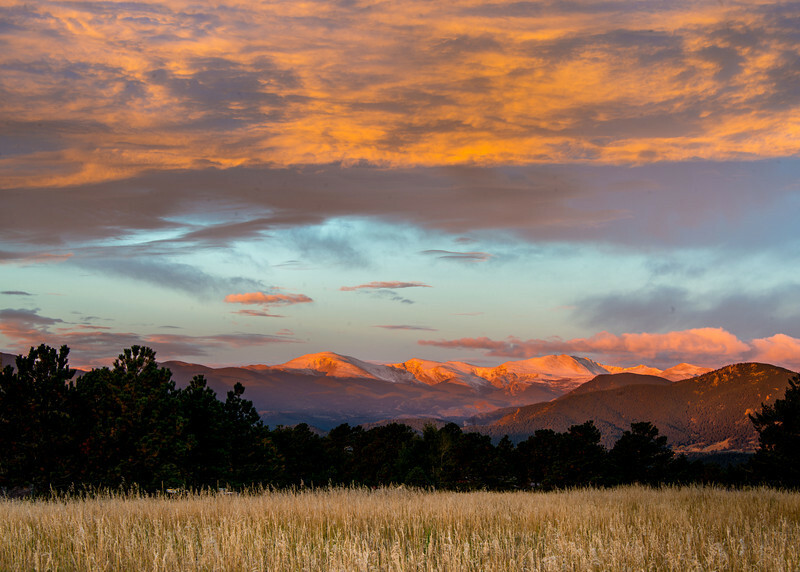 It is a new month, the tenth month of the year and here it began with a beautiful morning sunrise with the rays of light shimmering over snow on the peaks of our nearby 14ers. It is indeed incredibly peaceful and inspiring to begin a day with such beauty. Morning can be the most spiritual time of the day and peaceful beauty can be found if not in nature but in a verse of scripture, a poem, or the peaceful silence of a morning beginning. The beauty of peace can also be found in the warm touch of a loved one or a memory of one who has passed. It seems our minds are more open and in tune to spiritual feelings at this time of day. I treasure quiet morning time whether it is a minute or an hour. As I set out to capture this image along the way I passed a bull elk crossing the road in search of nearby cows, a man walking his dog, and a couple or two on their morning walk conversing with beautiful smiles. And there were people driving past on their commute to their day. Hopefully all caught a glimpse of beautiful color, interesting light, or a comforting song on the radio to aid them in their drive. Carving out such sacred time of a morning is something I am grateful for and all the more peaceful when I make time for this. Awareness is defined as knowledge or perception of a situation or fact; concern about and well-informed interest in a particular situation or development. 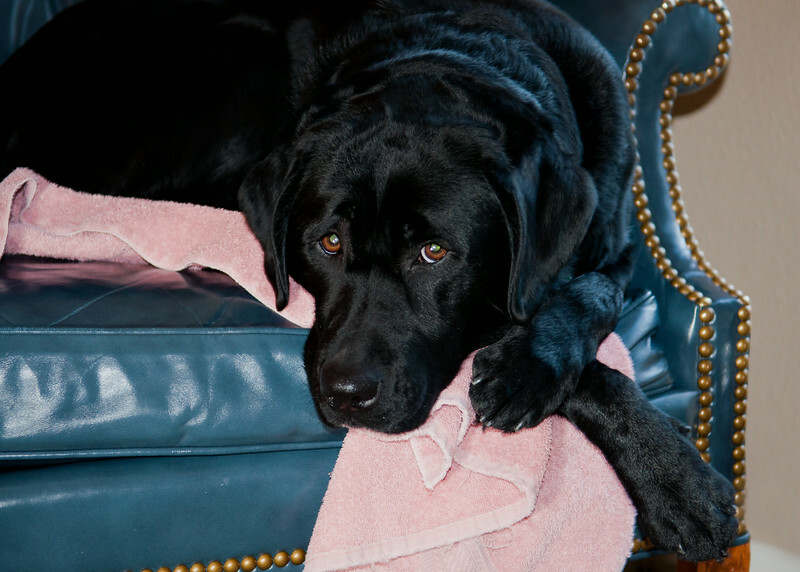 In this image the cute dog seems to be in his spot doing something he cherishes. The eyes, tongue, and body position come together to relay a sense of being totally aware of the action around him and nothing else would appear to be on his mind. This is just one of my favorite images because of the feeling it gives. Also it is unique since here in our country we do not see bicycles with built in large carriers. This image was captured in Vodelpark in Amsterdam. It is important to hold a keen awareness for the important things in life, the things that matter and will matter years from now. For each of us those things will vary for the most part, but there are some commonalties such as beauty in the goodness of humanity and beauty from nature, and the need to love and be loved. I am undoubtedly highly grateful for the times I am mindful and aware of the goodness and beauty around me and when my heart is heavy with love and joy. The rut is the mating season of ruminant animals such as deer, sheep, elk, moose, caribou, camel, goats, pronghorn and Asian and African antelope. 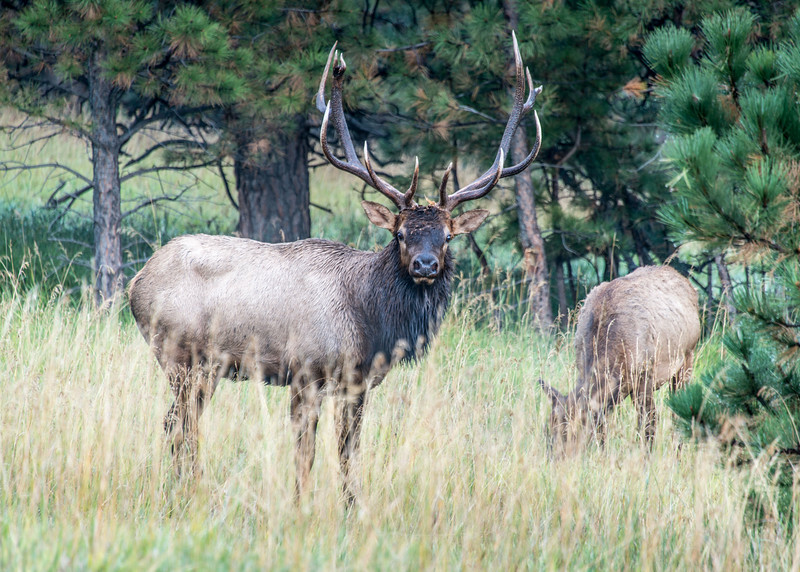 We have elk and deer living near us and the elk rut has aspects of a wild party with the loud bugling and snorting. It keeps residents awake at night. With this said it is always fun to experience and live near this activity of autumn despite the sleep deprived nights. It was with sweet satisfaction that we settled at the dinner table last evening with Sara and we heard this bull elk bugle. My camera and tripod were nearby so this image was taken from our back lower deck. This bull paused long enough and looked me in the eye which gave me the perfect opportunity to press the shutter. I am grateful to live near the rawness and beauty of nature. 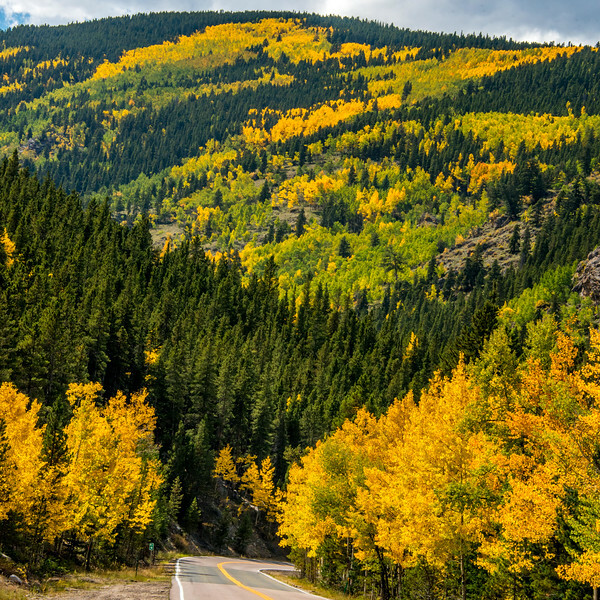 This time of year not only in Colorado but in many areas of the northern hemisphere that are experiencing autumn, nature is displaying a glorious show. Glory is defined as something that brings praise or fame to someone or something, something that is a source of great pride. Here in Colorado the leaves and grasses are giving us a tremendous last show before winter strips them of visible life. There is a buzz of talk about the colorful display of leaves. It is wonderful to hear from friends and strangers where they went or plan to go to see the leaves change. Fortunately, one does not have to venture too far to enjoy a glimpse of God’s glorious autumn palette. It is easy to feel glory for this intense beauty. 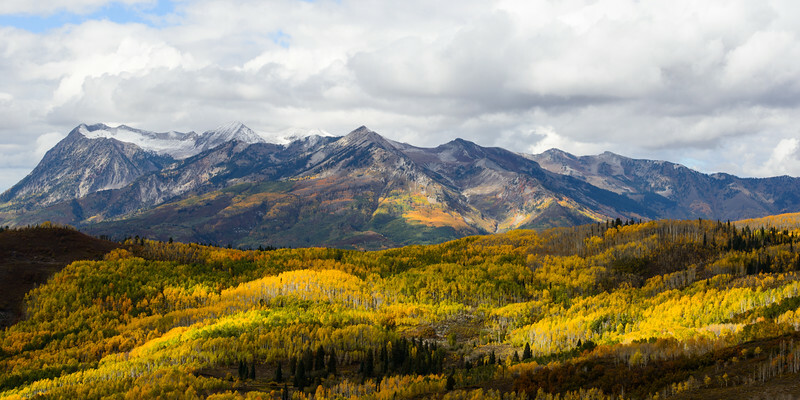 This image is of the Raggedy Mountains just off Kebler Pass. We hiked a short distance and our jaws dropped when this splendid scenery came into view. Colors, mountains, sunlight filtering through the clouds, all came together for a glorious view. Views like this can leave one speechless and reverent. Nature is great at doing that. I am grateful for the intense collage of colors painted throughout nature right now. I watched this and felt inspired, encouraged and filled with gratitude for this talented and cheerful man. He is truly living his life. Nature inspires me as well. 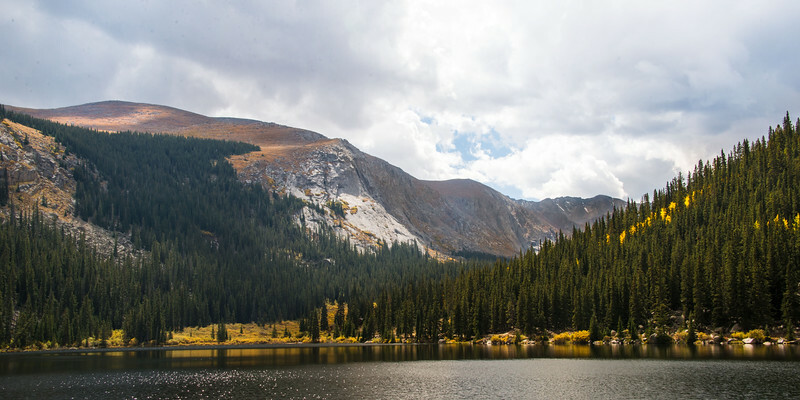 In this image of a mountain reservoir my husband and I were taking in the immense beauty of the water with the mountain backdrop laced with tundra grasses on the peaks and pine and aspen trees closer to the water. Then the clouds and sun began to play. It was lovely watching the sunlight chase the shadows up the peak. It was a beautiful moment to share together. Nature has a way of reminding us of our perspective and place in life. There is inspiration in today, whether it is in the face of a stranger, glimpse of nature, or verse in a book. Delight is the perfect word we felt this summer when Sara and Chris shared the most wonderful news of their pregnancy. This was such special news! In these past few months of adjusting to this growing life in our family, it has been very special to watch the changes in Sara. Watching our daughter blossom as a mother-to-be is touching, and we thank God for this blessing. Chris is glowing in his new role as father-to-be and taking good care of Sara. The milestones of development have become an addition to our reading. Life has new meaning. This image was taken shortly after Sara and Chris gave Bobby a second present for his birthday wrapped in the shape of a picture frame. When I saw the shape of this gift, I immediately jumped for joy as I suspected it was an announcement of a baby. It was a fun and never-to-forget birthday surprise for us. We look forward to becoming grandparents in mid March. Meander is a lovely word. I like the meaning to wander or stroll at random. In this day of multitasking, list checking, connectivity, there is seldom time to meander unless it is by purpose. Today’s quote by Anne Lamotte gives courage to seeking out time to meander quietly with yourself whether it is reading or writing, painting, watching a sunrise or sunset, or listening to your favorite Beethoven piece. It is important to find time to feed your soul, and if we use our time valuably there should be space in each day to do just that; unplug from life and journey inward for time each day. I am grateful when I make time to do this. In this image we had kept to the trail but our girl had been off leash. The joy in her body to run at will and smell all the messages that plants and rocks had for her was immensely satisfying to watch. Then to jump in the reservoir and retrieve a stick was so refreshing after where she had let herself meander. It is good to get off the beaten path, but on this day the trail held beauty for my husband and me. It was only when we were near the road in this image that my husband had to cinch her to her leash, feel the pull of her energy, and return to the populated world. It is the first day of autumn, a time of changing color in nature and cooling temperatures. Living in an area where there are definite seasons one notices the uniqueness of each one. The light of autumn is different from the light of spring. The activity of animals is different than their activity in the spring. Fall brings changes in our way of living. It is a time of biting into a crisp juicy apple, carving a pumpkin, watching a football game, and possibly raking leaves. Autumn is a beautiful time to be alive. We drove to a nearby 14,000 ft mountain for a hike this weekend and were blessed with the fabulous colors of the aspen trees and coolness in the air. 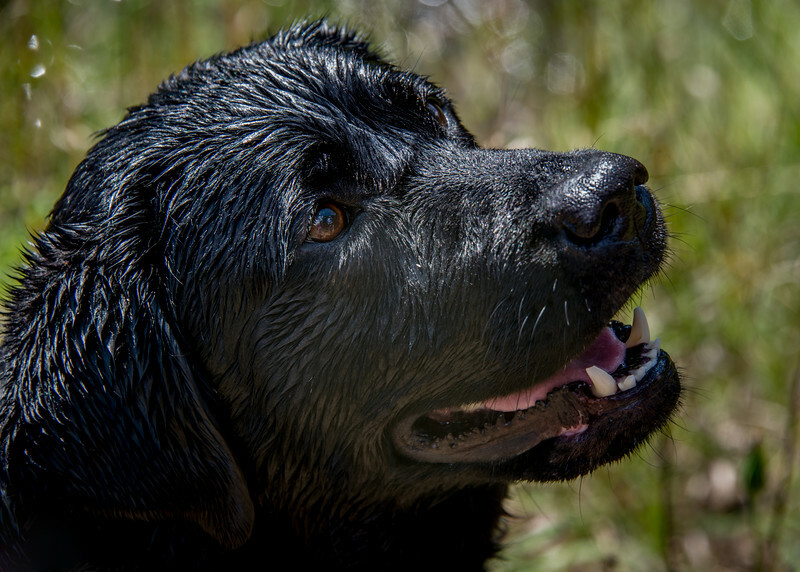 My husband tossed sticks in the reservoir for our girl to retrieve as we took in the vastness of God’s creation. Soon it will be too chilly for this waterside activity. I am grateful for the season and especially the beauty of autumn. "To every thing there is a season, and a time to every purpose under the heaven: A time to be born, and a time to die; a time to plant, and a time to pluck up that which is planted;"
The beauty of the last days of summer with the active wildlife is a wonderful combination. The leaves and grasses are changing color to a beautiful golden or flaming orange. The male elk is looking forward to the rut. These are the obvious signs of coming autumn here in the foothills. It is a beautiful time of year. And it is Friday which makes it all the more wonderful to make time to enjoy the beauty around us. It is the last weekend of summer. 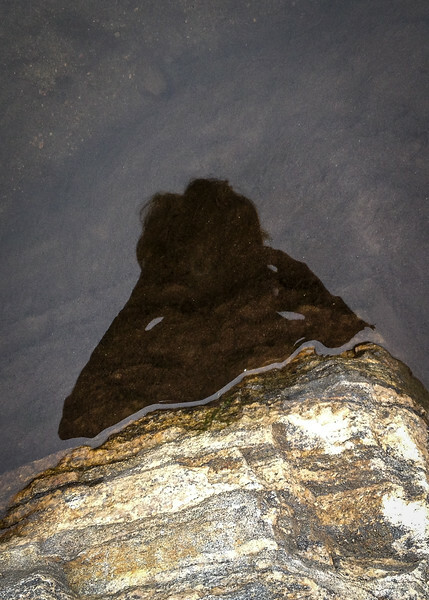 This image was captured at the lake. 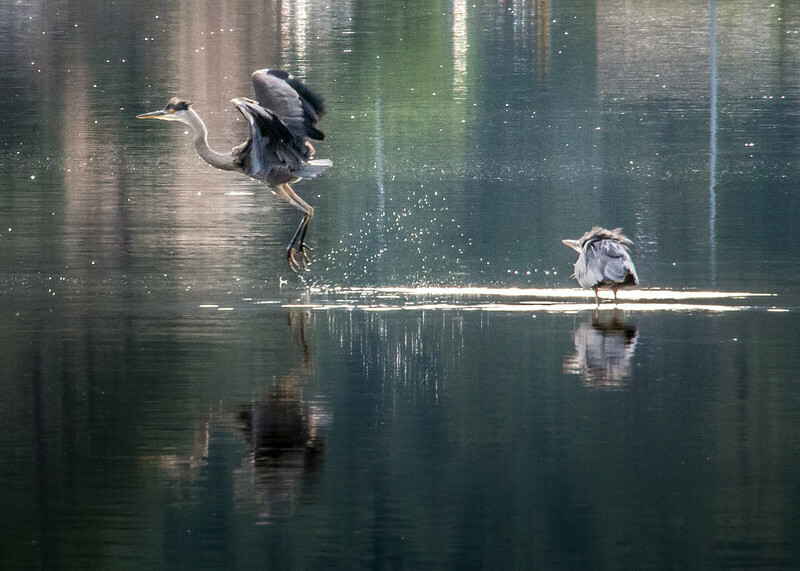 It was a fortunate experience to see two herons. The one on the right certainly looks young. These birds are elegant in their manner of hunting and flying and are a gift to observe. We are fortunate to live in such beauty and I am grateful to walk amongst such inspiration. Do you ever have an image in your mind you can go to when you just need a quiet place and a quiet place is not anywhere in site? As a father on a popular TV show would say, “Serenity Now!” In this over scheduled world sometimes it is of value to take a time out when the noise in your head gets unmanageable. This image was captured in a popular park one Saturday. It was a place of quiet refuge for us. This entire park had about 10,000 visitors who mainly passed this beautiful scene by in their haste to get to the next area of interest. We lingered here, drawn in by all the pond life and the sounds of nature. There were trout lingering below the surface choosing which water bugs were worth their effort, the spiders busy in their work, and plant life framing the water and giving shelter to more bugs. It was a refuge of peace to two people in need of quiet. I am deeply grateful for places or times of serenity. Places of solace and serenity are important whether they are in our mind’s eye or ones that our feet can take us to for a welcome break. 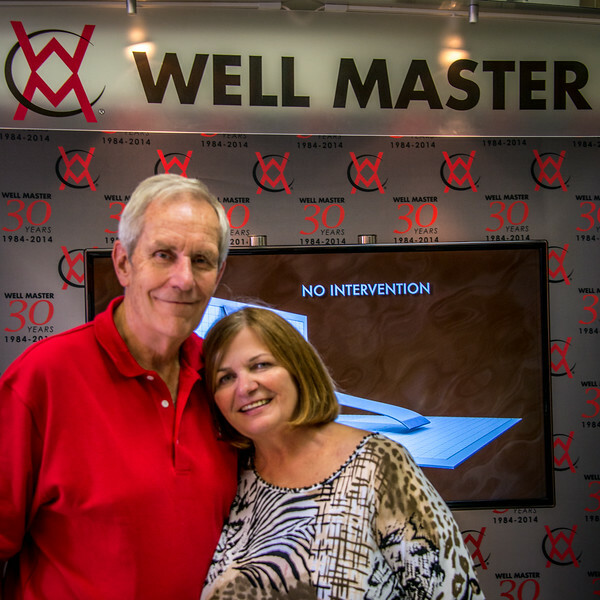 Yesterday afternoon I was invited to capture the moments of a 30 year anniversary celebration of a highly successful company, Well Master. Rob Bender started this company in 1984. It was his idea, dream, and desire. Success certainly did not come easy especially in the ups and downs of the oil and gas industry. But this man’s dream and leadership style led to this company being the success it is today. He surrounded himself with dynamic people who shared his vision. The positive energy of the employees is a testament to the type of leadership style exemplified by Rob that is in short supply in our business world. This company values each employee. It was obvious the employees give their best and enjoy their work. It felt like being around a happy family. The company is recognized as one of the Colorado companies to watch. It was gratifying to watch the leaders of this company share the success with their employees and families. This image of Rob and his beautiful wife, Barb was taken at the celebration. They are a wonderful team. It was an honor to capture the moments of celebration of their hard-earned success. A bridge is a pathway that connects two opposite sides. It provides a way for people to connect with someone or something. In our humanness we can be a bridge of hope to someone in need of a way to a loving or safe place. These quotes today remind us of the beauty and strength of bridges. An outstretched hand can be a bridge just as a warm embrace. I am grateful for the strength and beauty of bridges in everyday life. Maybe today, there will be an opportunity to be a bridge or to cross a bridge to a better place. There is in my day. 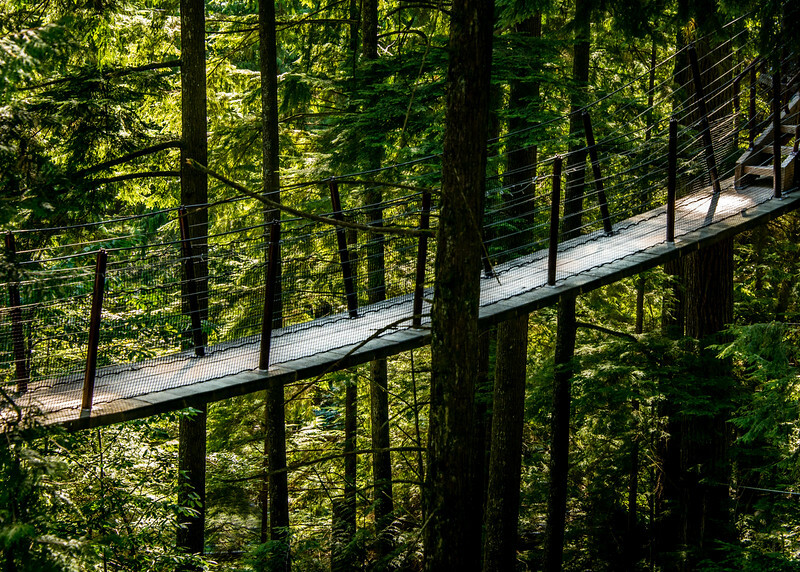 This image was captured in Capilano Suspension Bridge Park. It is an interesting place to visit while visiting Vancouver, British Columbia. This was one of the smaller bridges that was part of the treetops area. This is an image which represents the idea of focus extremely well. This bee is closing in on what it wants. 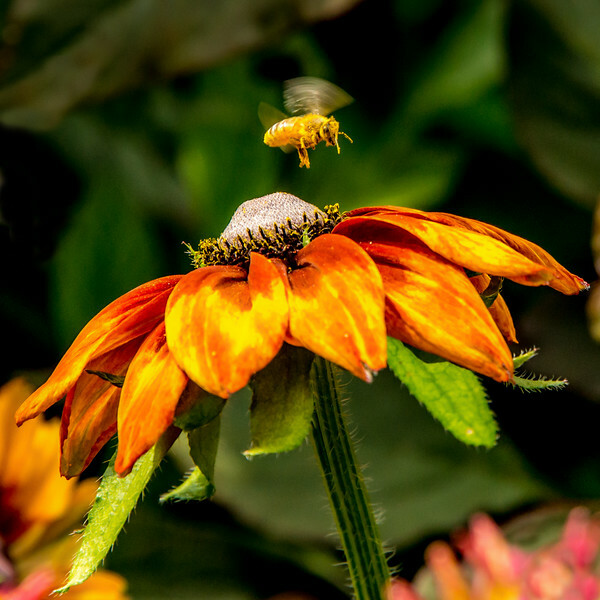 I had my focus clearly on the bee and flower. My shutter speed could have been faster to capture the full movement of the wings but the image is very effective as it is. Focus is a very important aspect in our daily life. A good listener focuses on what is being said. A safe driver focuses on the road. Too much focus can interfere with the learning process. Recently an article-" 13 STEPS TO BETTER STUDY SKILLS “ by Judi Kesselman-Turkel cited the importance of periods of incubation. She defined incubation as the period of first encountering a problem and arriving at its solution. Studies have shown that learners, scientists, innovators that take breaks from their issue at hand by going for a walk, taking a nap, even brushing teeth, have a higher success rate of doing better on an assignment. Albert Einstein would leave space in his day for giving his mind a break. Taking a break also lowers the chance of burnout. It is important for us to remember the benefits of taking a break in our busy day. Instead of feeling guilty about this we should feel we are honoring our body by bringing our best to a situation. 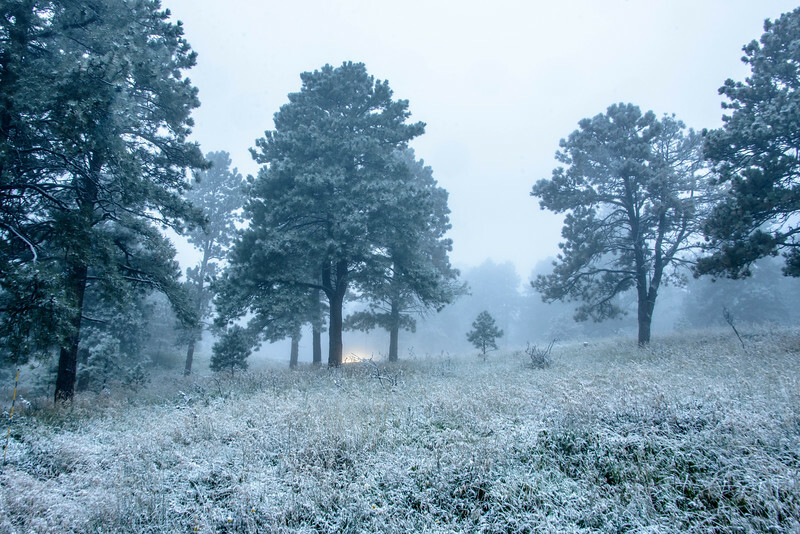 The first snowfall is always an exciting event for us since we love the changing seasons. For many weeks now it has felt like autumn so snow was inevitable. To hear the snowplows in the distance and wake to a light blanket of white makes autumn seem real despite what the calendar shows. The wonderful thing about today’s wet snow is that by afternoon it will be a memory and the weekend weather is predicted to be warm and beautiful sunshine. I am grateful today and every year for the first snowfall. Looking out this morning to the white tinted landscape gave me a feeling of peace since there was no where I needed to be. It is a gift to enjoy from the comforts of a cup of coffee and slippers. And for all those behind the steering wheel this morning, may you enjoy a glimpse of beauty in your effort to get to your destination. 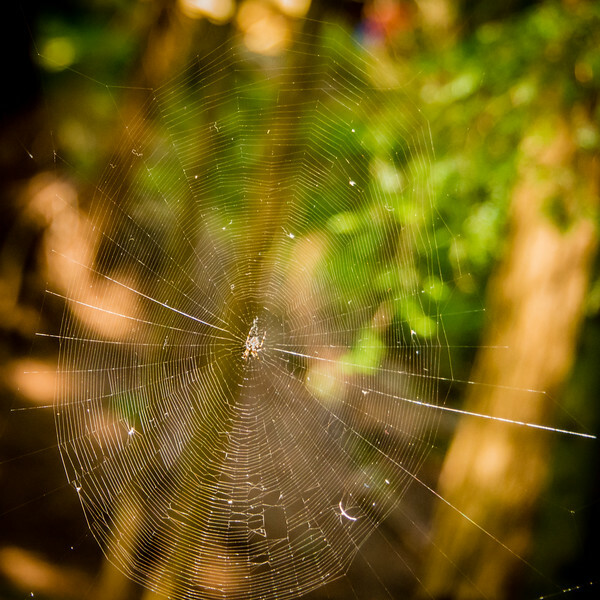 Life is referred to occasionally as a web due to its intricacies and breadth. 13 years ago today a horrific event occurred in our country that not only had an effect on all Americans but people all over the world. The outpouring of love in response to this terrible tragedy rippled across our interconnected world. My husband spotted this web recently and it just caught our attention and drew us in for a long and closer look. Rarely do we get to see an undisturbed spider’s web. It is easy to marvel at the mystery and miracle of this intricate piece of construction. How does a spider do this? As fragile as it appears it gives a stronghold of life to a spider. What ripples on one strand affects the entire web. Mr. Chopra’s quote gives us encouragement and validation of the power each of us has to make a difference in this web of life. Each strand or segment is connected and supports the surrounding segments. The power one has when it is used for good can have such amazing and beautiful implications. When terrible things happen, it is essential to remember and see the goodness of humanity around us. I am saddened by the loss of life and innocence of September 11, 2001, but I am grateful for the goodness that is in us that brings truth, peace, and love to our fellow man. I close with this beautiful quote from the special book, Charlotte’s Web. What do you think when you look at this image? Why is this child alone? Where is the parent? It can provoke such feelings. Just looking at the toddler on the cold hard stairs of a major downtown building just feet away from a busy street would leave one to jump to conclusions and form an opinion on parenting. That would be taking this situation out of context. Context is defined as the circumstances that form the setting for an event, statement, or idea, and in terms of which it can be fully understood and assessed. This image was captured after observing a woman with a stroller and this toddler. The mother or caregiver had to take the stroller up the stairs first and then come back for the toddler. 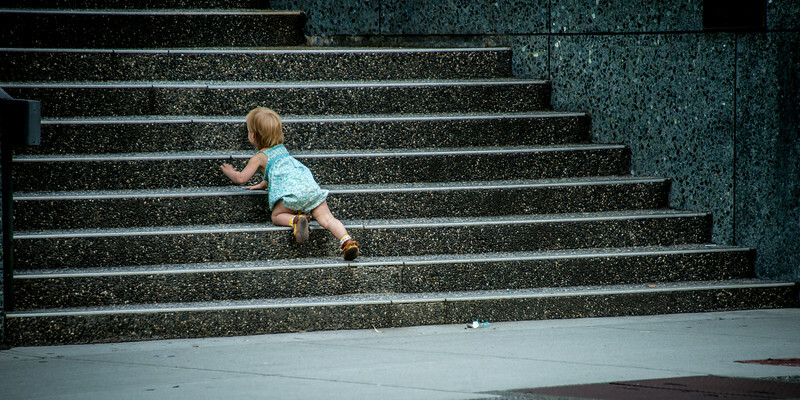 The toddler seeing the person of trust began crawling the stairs toward her. This scene certainly captured my attention. Since it was known the child was not in any danger the photo was set up and taken. It seems like these days of the 24 hour news cycle, the news business thrives on reporting a story as soon as a situation unfolds which can lead to information that is taken out of context. Jumping to conclusions before knowing the facts can lead to misinformation and unnecessary worry or angst. It takes such discipline to keep from jumping to conclusions. It is very easy to do this though. News organizations certainly do not own this. Daily we are bombarded with information. To be slow to judge and form opinions is difficult. Fortunately, it is possible to do. Being in place for observing sunset is a real treat and inspiration. Although it was a cloudless evening, the closing colors of daytime were showing themselves to be striking. There is something about sunsets and sunrises that gives me perspective on my life. They remind me of my minute size in the big scheme of life and how little worry or fear matter. These bookends of a day do remind me of my treasures which I hold dear and are irreplaceable. I am so grateful to be reminded of the importance of what truly matters in life. This image was from the southern edge of Stanley Park in Vancouver. It was a gift to be here with my husband and enjoy the beauty and serenity of sunset. 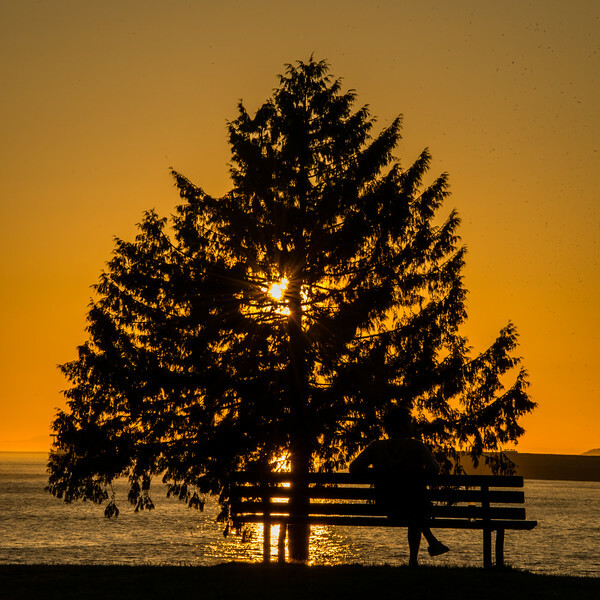 In this image I used the person on a bench and tree to give it additional meaning of perspective and value. 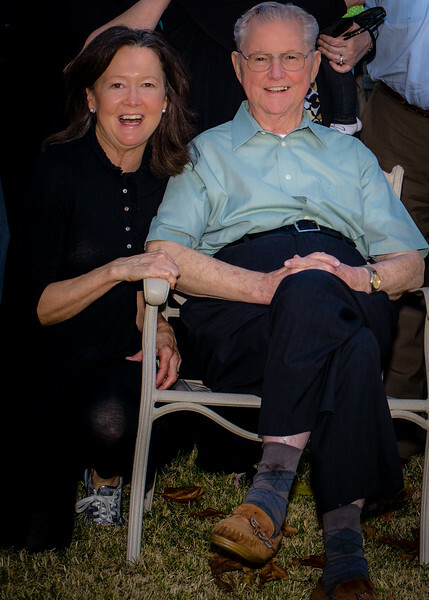 Today there is tremendous gratitude for a very special man in our family, my husband’s father, and someone I call Dad. I have had the honor to know and love this man for 43 years. He is a man with tremendous faith in Christ, and a man who walks the walk of faith everyday. He is a dedicated loving husband of 62 years, father to a wonderful son and daughter, grandfather to three loving grandchildren and one beautiful great granddaughter. He had a long career serving his country in the army with tours of duty in Korea and Vietnam. After retiring from the service he had a very successful career in sales at Sears. He is a giver. He is a man of quiet strength. He tried for years to quit smoking and when he found out my husband and I were expecting a baby, he successfully quit smoking the day he found out. He always had room on his lap to read a story to a grandchild, help his loving wife with anything around the home or give help as needed to his children. He is quite the cribbage player and a lifelong St. Louis Cardinals fan. He excels in telling a joke and can be found most week day mornings at the gym with a joke to share and on Sundays at Western Hills Christian Church. He is a winner! I am very grateful to honor this loving man today on his birthday. The ability to listen is a wonderful gift. Somedays listening comes easy for me but there are days my tongue desires more time in action than my ears. On those days there is little that has been learned or understood because my words get in the way of understanding others. I am supremely grateful for the work put in to being a good listener. A person who listens is a treasure. The quiet moments in life allow us to hear the inner voice that offers wisdom. Listening offers a chance to understand others and learn where they are coming from. Contemplating another’s point of view builds bridges of understanding. To find an image that captures listening was a stretch so when in a pinch I go to our girl. Dogs want to understand what is said by their people. They embody the visual for listening with their penetrating eyes, attention, and silence. She can give us her full attention and focus when she wants to. There was no food involved here, but there was the chance of retrieving her floaty in the creek if she just paid attention. I am grateful for the benefits of listening and my desire to improve on this wonderful trait. Moments of solitude in a day can be reinvigorating to the soul. Have you ever thought about the portion of your day where the noise of the manmade world is silenced and you are alone? For many solitude is rare and precious so it is a gift. And for others solitude is a prison because their entire day is spent in loneliness. There is a fine line between the gift and curse of solitude. For some it is something to plan for and for others it is something to endure. This morning came very early so the day began in beautiful silence as daybreak progressed.Sounds from nature began before the noise of mankind. As this post is written, a hummingbird buzzes me and stares at me for what seems like seconds. How marvelous this is since they will soon be on their way to warmer temperatures. 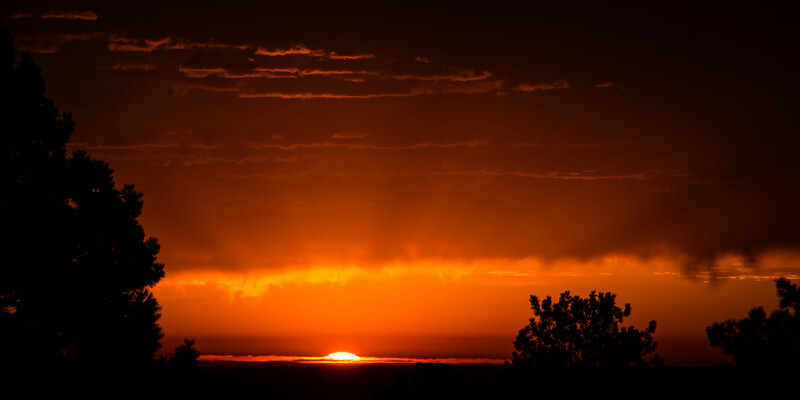 In this image the beautiful sunrise was enjoyed in solitude. Watching a sunrise is a beautiful time of peace and inspiration. It is a devotion in itself. The times when my husband and I enjoy a sunrise makes for a quiet time together for a sunrise can speak for itself. I am grateful for the luxury of solitude. Everyday life has many doors for each of us. The idea of a door brings to mind an opening of thought or opportunity, whether it is a literal or figurative door. Doors capture my attention. I appreciate Emerson’s quote today as it invites one to be an encourager to others. The closing quote from the book of Matthew is about prayer which is an immense supportive power for all the doors in our life. In this image the colorful doors initially captured my attention, but as I watched I noticed the stack of books to the right. It was a wonderful scene to watch. People stopped, bent over, and looked through the books. 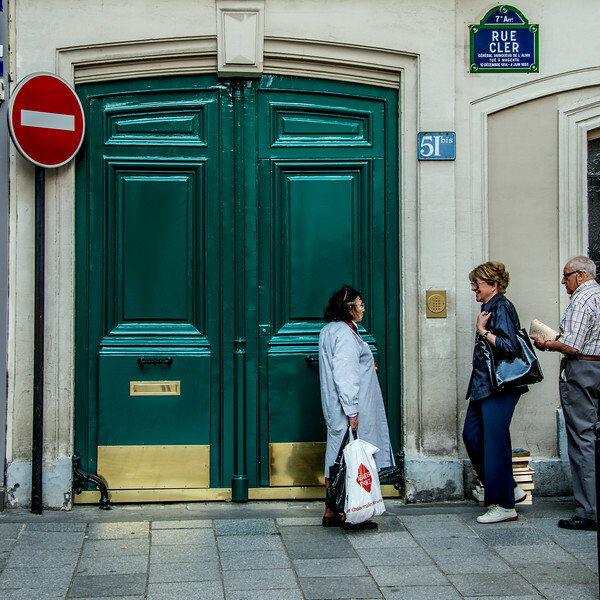 It became a place of contact for those curious about the books and the doors each could open. It was also an opportunity for conversation. After visiting, each selected a book or two and went on about their day. It was an interesting scene to watch. I am deeply grateful for prayer for all the doors in my life. It is the tenth month of the year. Yesterday was Labor Day, a major holiday that originally was set up as a day to celebrate labor group’s contributions to the economy of the US. Now it is mainly enjoyed as an end to summer and a day to enjoy time off from work. It was lovely having extra time together with family and to enjoy one last summer activity together. Evergreen Lake area is a magnate for summer fun. With some time on the lake for kayaking and then letting our girl swim in the creek that feeds this lake, it made for quality time together. Watching Belle swim is such fun. 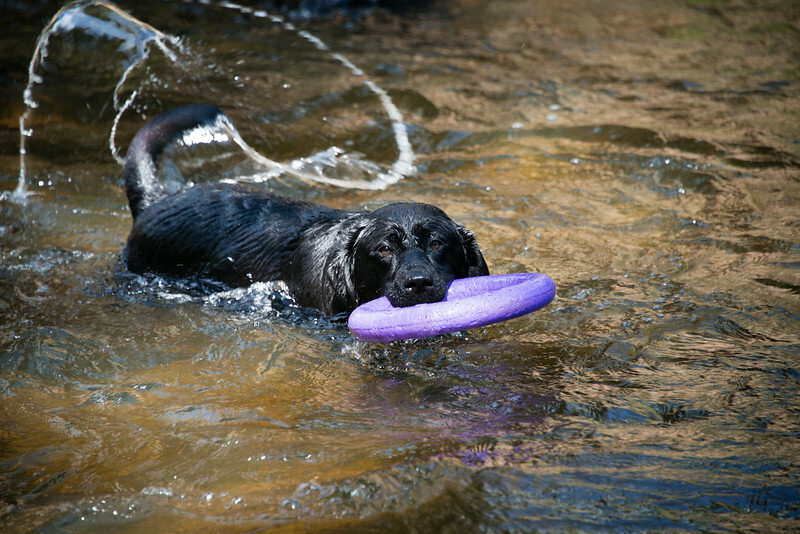 Retrieving her purple ring in the water comes naturally to her and makes her so happy and a bit zealous to do it again. I am grateful for the time together and look forward to the beautiful and colorful days of approaching fall. Humility is defined as a modest opinion or estimate of one's own importance; having a clear perspective, and therefore respect, for one's place in context. It is the opposite of narcism or excess of pride. Although another form of the word, humiliation can be unkind; humility is considered a virtue in various religions and philosophical beliefs. I belong to a club for photography and enjoy the ability to learn from others as well as the exchange of ideas and information. At one meeting a month there is a theme along with an open category. Both are judged. My photos are submitted regularly. Periodically, I might think highly of my image and then comes the critique. It is a great way to learn and improve. It helps to be humble and ready to learn how the image can be improved. And on rare occasions it is great when the judge is highly positive with little or no corrections. In this particular image the judge had positive things to say but added many suggestions, which when applied made this a stronger image. I am grateful for the wonderful benefit of learning from others. Focusing on gratitude this year has been an enlightening exercise. It truly has made a difference in the way each day is lived. Gratitude is practiced all over the world, in all types of circumstances. Today there are two quotes from people who lived in extreme and harsh circumstances. The message is clear from both that in everything there is gratitude to be found. These two people touch my heart with their clarity and focus on living life as best one can. 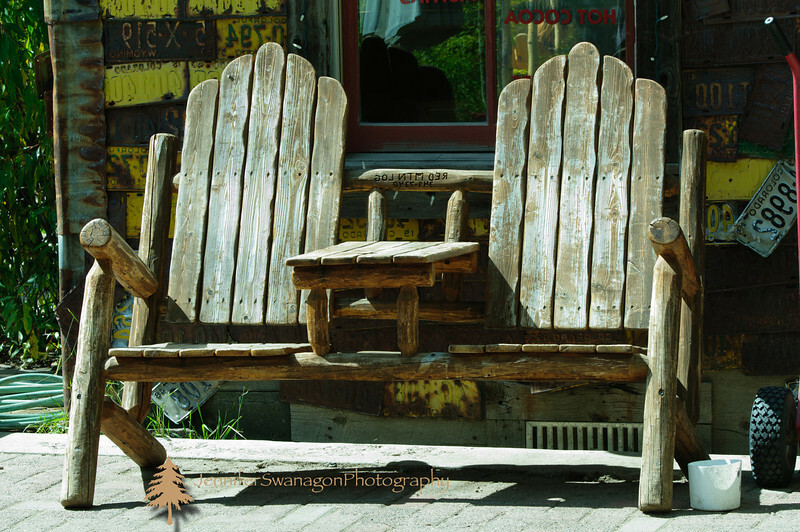 In this image these chairs captured my attention from a popular coffee shop in Crested Butte. When I look at this image in the context of today’s post, it brings to mind the fact that I am still here in this life, living, loving, learning, laughing, and crying, but there are many people close to my heart that are no longer here. I am grateful for their memory and experiences shared with them, and for the experiences and opportunities that remain for me in this life. Beauty is in the eye of the beholder. If ten people were questioned on beauty, their answers would not be the same or possibly not even similar. What one thinks is beautiful changes over the course of a person’s life. Also one’s place in life would surely affect their definition of beauty. A homeless person might think an act of kindness is beautiful; a hungry person-food, a lonely person- a thoughtful gesture, or a sick person-healing. At this age where I am pleasantly planted, beauty has an entirely different meaning than in the days of my younger self. Now, beauty has a lot to do with compassion, simplicity, and genuine kindness. In this image the beauty of the cow caring for her newborn calf touches me and warms my heart. The calf, just minutes into this world is receiving love and protection from the cow. The cow cleans the calf and eats all evidence of the birth in order to protect the calf from predators. It was a beautiful image to capture. 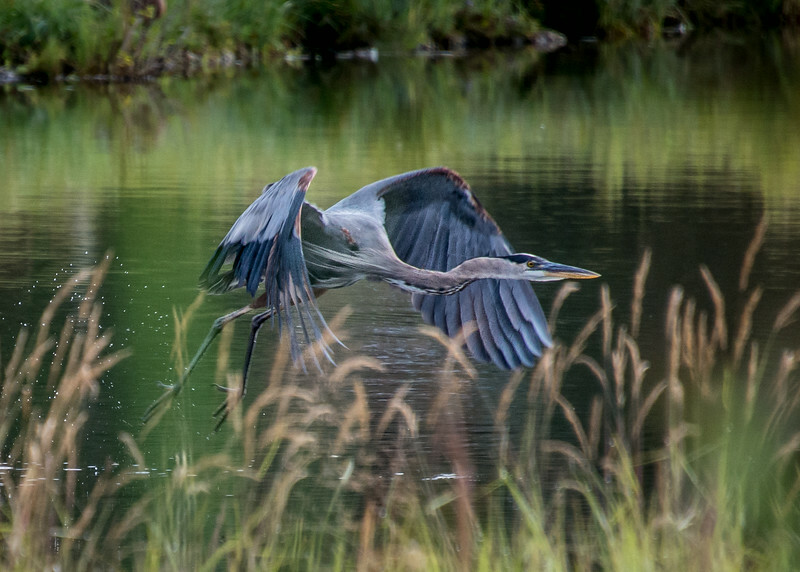 Since spring there have been blue herons at the lake that have eluded my lens until today. This morning seemed like a good morning to head to the lake and see what was happening with the area wildlife. The ground was wet and the air was cool and sweet with some patches of fog. The herons were in sight, and it was a treat to observe them. Herons are striking birds with their colorful and distinctive feathers. They appear to be a bird that observes the surroundings while maintaining a quiet presence. These are impressive characteristics to have in life. It was most enjoyable observing their elegance. 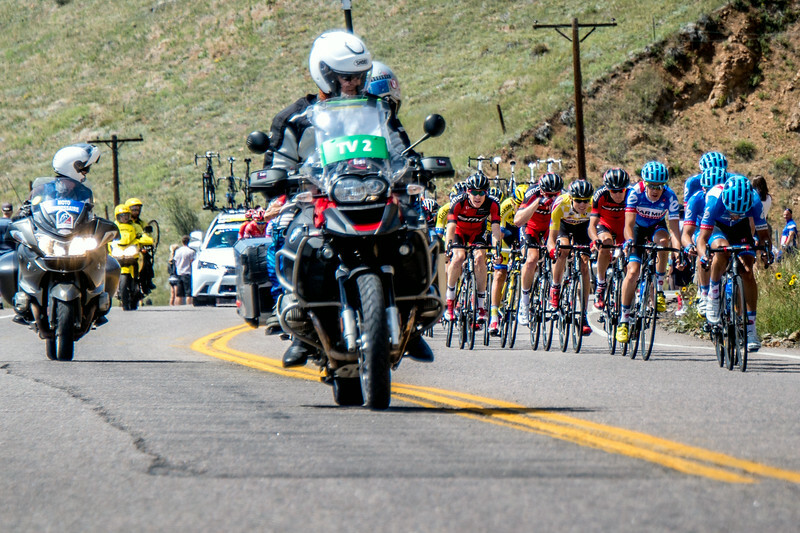 This past week was the 4th year of the USA Pro Cycling Challenge here in Colorado. From Monday to Sunday these ultra athlete cyclists ride with the support of a team and compete in this incredibly difficult race. This year there were ten host cities across Colorado. 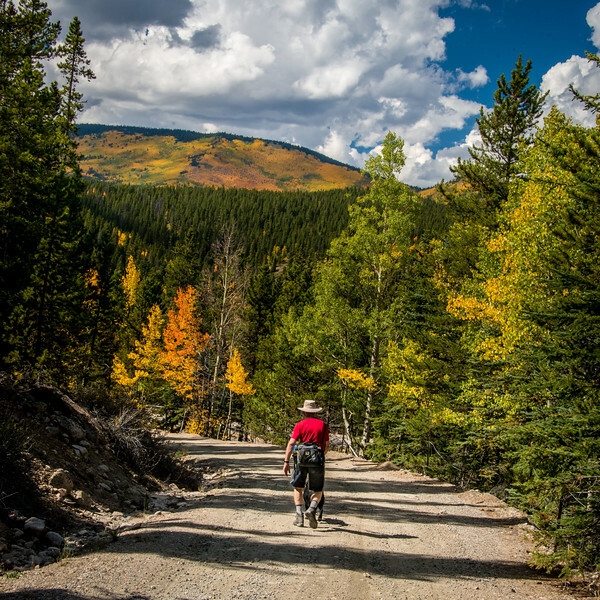 The 550 mile course had a total elevation gain of 40,000 feet over seven days with the highest elevation at 11,542 feet on Hoosier Pass. There was a mountain top finish at Monarch Pass this year. These riders experienced 3 seasons of weather over the week. It was fun to follow the race throughout the week on television. I cannot imagine the training and discipline that goes into competing at this level. This image captures the peloton, the main group of riders that ride as a group almost like birds in formation. These riders save energy by riding close which is referred to as drafting near or behind other riders. The reduction in air resistance is impressive; in the middle of a peloton it can be as much as 40%. Thus this group shares in the work and saves energy as well. It is fun to see who breaks from the peloton to move ahead. Listening to and watching the news of the world has been extremely unsettling. It is hard to take in what is happening with people in the conflict areas around the globe. Whether it is the barbaric extremists or people fighting over religion or land it is so sad to know that there are people living in misery, pain or any other type of conflict. That there are people so set in their beliefs that they make other people suffer for their lack of belief. Then the Ebola virus is enough on its own to alarm the world and sadden us to see the suffering this virus causes. What is one to do with so much sorrow? Prayers are helpful as well as supporting causes that promote peace. We must continue to look to the good around us and within us because so very often the troubling news gets the focus. We do not have to look far at all to find people doing great things for peace and improving the quality of life for others. This image is from a Habitat for Humanity build in the Denver area and this volunteer spent the day applying insulation in a small basement crawlspace. It did not look like a pleasant task, but it was obvious she thought differently. Look for the good and be thankful for it. The days of August are passing quickly; school bells are ringing, the temperatures are a few degrees cooler, and football is back. Another characteristic of this time of year- cling free peaches have arrived in the farmer’s market. A box of peaches has been purchased for this household of peach fanatics every week. Palisade peaches are just simply splendid. This past week two boxes were purchased with the idea in mind that it was time to make peach preserves. The internet is just so helpful when looking for a recipe. Once a recipe met approval, there was a plan of action; with all the materials at hand, this process took place yesterday. This particular recipe interested me due to the fact that pectin, the ingredient added to thicken preserves was not needed. In its place was the process of repeated boiling and cooling a total of five times. This certainly seemed like a lot of work, but with the day set aside and the goal of preserving the succulent flavor of peaches for the fall and winter, it just seemed the perfect thing to do. This batch of preserves from 11 pounds of peaches, is the result of a day’s work. 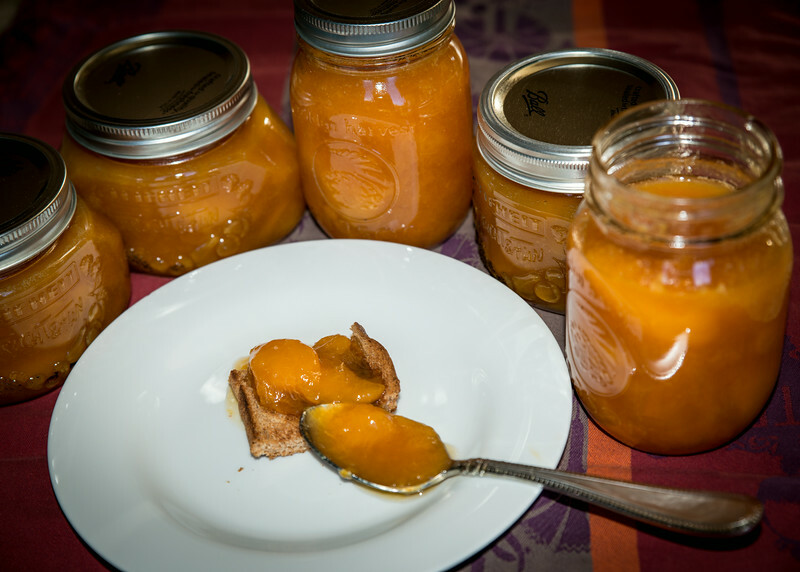 Although it might not seem like much, as I processed the last jar I committed to make this recipe again with the idea there will not be a shortage of peach jam this winter. One of the sweetest and most thoughtful gifts at the holidays is a loved one’s gift from their talented hands. Now there will be something to give in return. This quote captured my attention today. Looking around my home this morning, it is easy to fill a to-do list for the day with the things that were not finished yesterday. Sitting outside on the deck enjoying the peace that a morning can bring, invites me to add a different range of things to my list and encourages me to leave time for the unexpected moments that can make a day memorable and special. This quote certainly speaks to that. Mary Oliver ends her poem, The Summer Day with the question, 'Tell me, what it is you plan to do with your one wild and precious life?’ There is so much to do in life and so little time. Life is out there just begging us to dive in, enjoy, serve, love and live. This image was incredibly fun to take of Henry at his 4th birthday party. 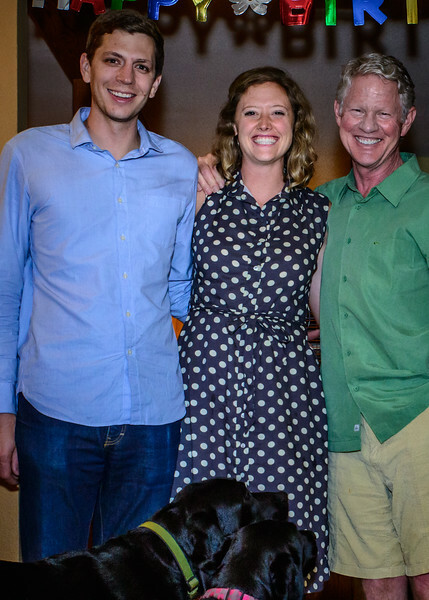 Henry is a big part of our Colorado family. 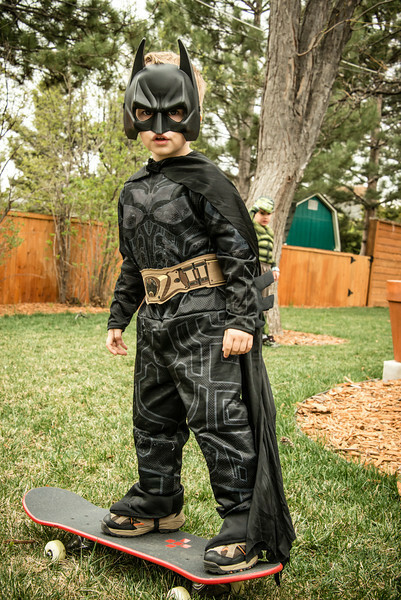 His party had a Batman theme, but here he was captured taking time to enjoy his skateboard. His passion of four years of life dominates this image. If there was a poster child for childlike enthusiasm this fun, sweet little guy would be the perfect candidate. Everything he does, he does with gusto. I am grateful for this day and the opportunities within it. You have a life- just imagine that! This has been a mild summer in most of Colorado. A mild summer here means lack of wildfires, no excessive flooding, pleasant temperatures and frequent afternoon showers that do not last more than an hour or so. 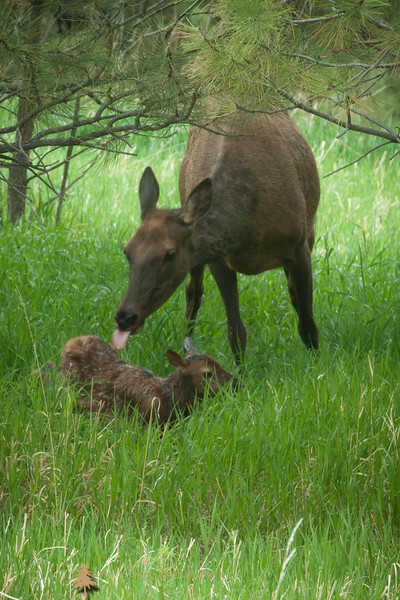 It also means that the deer and elk have plenty of native grass in the meadows to satisfy their appetites thus leaving the flower beds to the enjoyment of people. 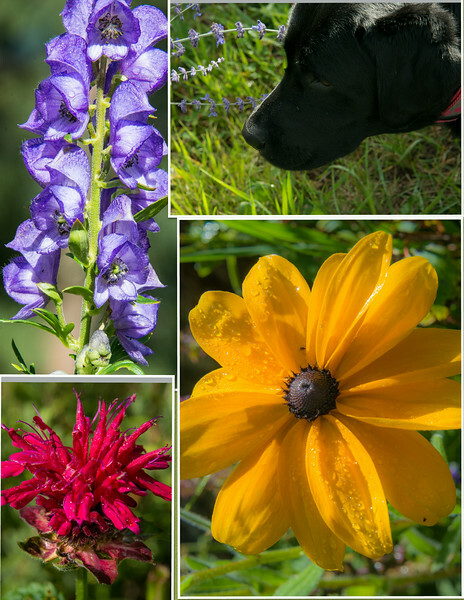 This is a collage of some of the flowers that do well in my flower bed. These are low maintenance and bloom for long periods. There is the native monkshood purchased years ago at our native plant sale. Some years it fares better than in others and so this year it is enjoying the ability to fourish in full color in its place of growth. Also pictured are bee balm, black-eyed susan, and russian sage. 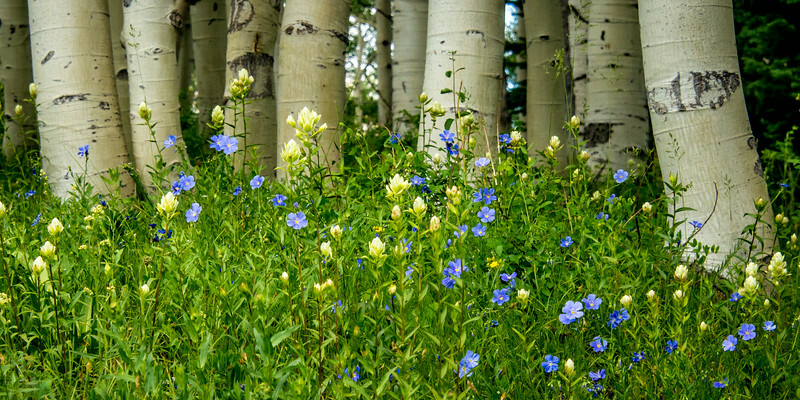 These plants do well in attracting honey bees and the sage and monkshood are resistant to the curious elk and deer. It is gratifying to enjoy the colors of the neighborhood beds this year. I am grateful that the elk and deer are happy as well. School Days are here and open today for a new school year. As I write this I hear the sound of the bus that provides a way to school for the high school youth in our area. Pretty soon the middle school bus and elementary buses will be looking for their riders. 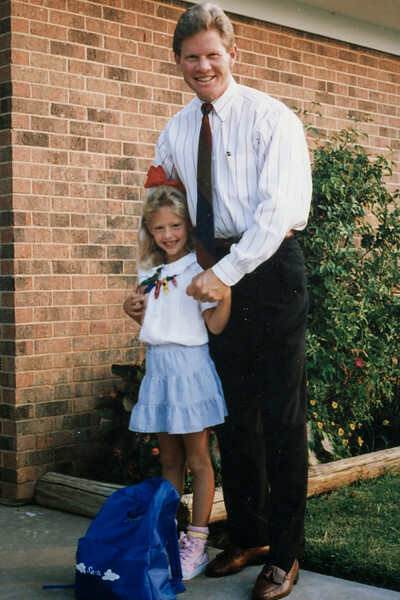 The first day of school brings many wonderful memories to our family. Looking forward to guiding and forming relationships with a new class of students was an exciting feeling. Then when our daughter reached school age that just added a wonderful new light to the day. Choosing supplies and something to wear and seeing the excitement from her perspective added validation to me that I had chosen a wonderful and important career. Teachers are so important to the education of a child. When the teacher is passionate about his or her role and has a desire to inspire and encourage the students, it makes all the difference in the world. This image is from the first day of kindergarten. It brings back so many wonderful memories. Every year we took a picture on the first day of school. We are so very grateful to all of her teachers for making a difference in our daughter. Now our daughter experiences the first day of school as a teacher ready to inspire and encourage a new group of children. This week it was with regret that we were out of town for our farmer’s market and the weekly replenishment of Palisade peaches and Olathe corn, but for compensation we were able to visit the famous farmer’s market in Seattle. 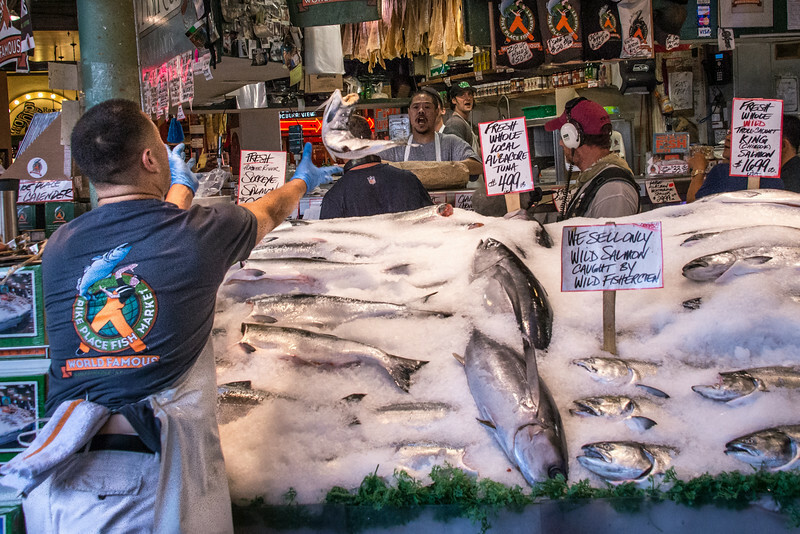 Pike Place Market is a happening especially with a particular fish vendor. They have been on television for the enthusiastic selling of the local fresh fish. It was a joy to watch. It was with patience that this image was captured because care was needed to listen to the requests and get the lingo down for when the fish would be tossed. To their credit only certain types of fish are tossed. None are damaged in this enthusiastic display, and it is fun to observe. Farmer’s markets are a joy to visit especially when you have something in mind to take home and share with family and friends. Life is too short! This is a line heard and expressed often, but have you thought about it lately and made some adjustments in your list of things you would like to do? It is helpful to have a list and check it periodically. Continuing to do what brings meaning and joy in life and staying active in your community are important ways to contribute to the quality in your life. I am grateful for people that inspire me in life and encourage me to keep growing. This image brings such meaning to me. 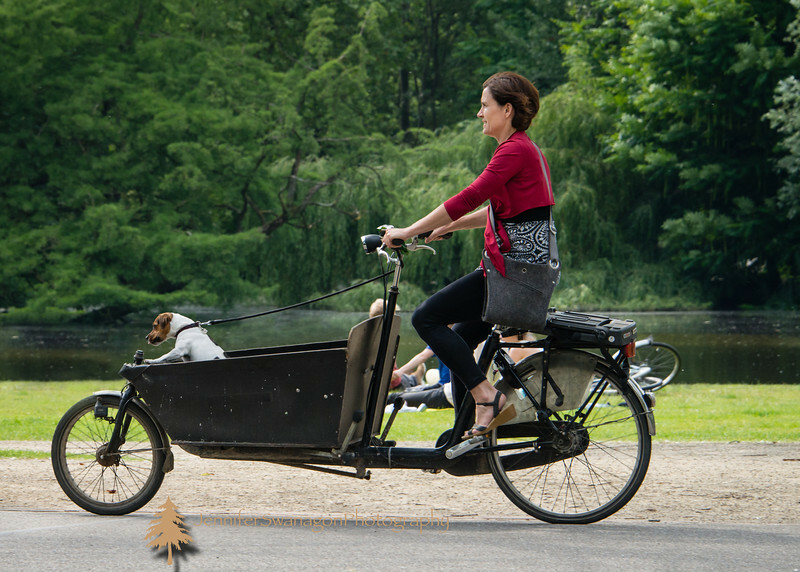 It was taken in Vondelpark last summer in Amsterdam. These women captured my attention because one does not see this in our country. These ladies might have been going home from work or going out for some event. It was their age, style of dress, and companionship that captured my interest. 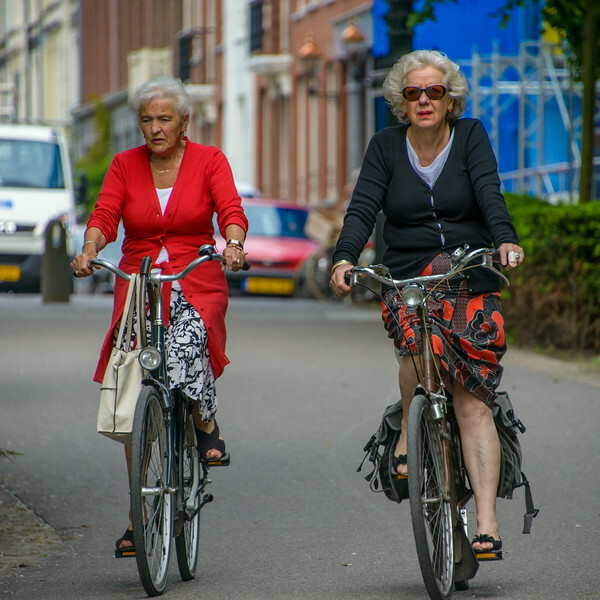 This image speaks to me of staying young at heart and active. Movies, books, stories, poems and examples of redemption weigh heavily on my heart. If redemption is the theme, it draws me in for a closer look. Personal redemption can play a powerful role in a person’s life and can be cause for celebration and peace. I have observed redemption at work in life and marvel at the life changing benefits as it takes great work and strength and commitment for one to be at a place of a silver lining. 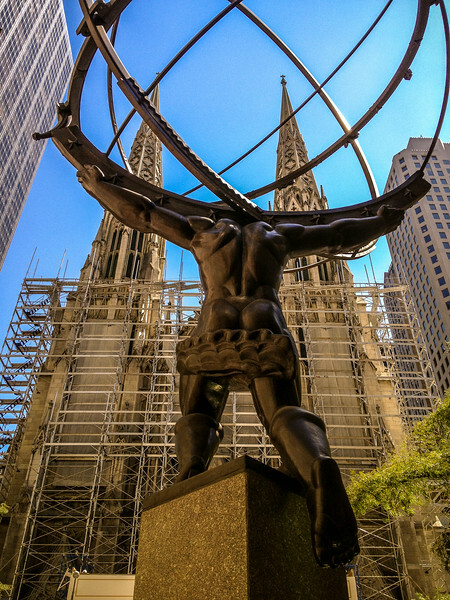 To find an image reflecting redemption was a challenge but in perusing my iPhone this one seemed perfect with the statue of Atlas carrying the weight of the world on his shoulders with St. Patrick’s cathedral in the background. Personal strength comes from within and from the goodness and grace of God. “You cannot amputate your history from your destiny, because that is redemption.”~ Beth Moore. Yesterday, we lost a brilliant human being full of talent and compassion, Robin Williams. This man changed television viewing for my husband and me while in our twenties. Thursday nights became a celebration of laughter with his presence in Mork and Mindy. What raw talent and intelligent wit he portrayed. His acting career was filled with warmth and depth of the vast wealth of talent he brought to a role. I am so very grateful for the joy and intelligence this talented man brought into the homes across the country. It was heartbreaking to read that it was severe depression that resulted in the choice he made to leave this world. He was so courageous to bring light to the serious problem of depression and mental illness. Hopefully in our lifetime mental illness will lose its insidious stigma. It is an illness like cancer and diabetes. It deserves to be viewed without stigma. One does not make a conscious choice to be depressed. It is a chemical imbalance in the brain. It is not a weakness in a person’s character, but just the opposite as it takes great courage to fight this disease and get proper treatment. He certainly had been in treatment. Thank you Robin Williams for the joy and talent you brought over the years. Thank you also for the courage you had in speaking about your disease. I pray you rest in peace. I pray also that the medical community and spokespeople for this disease will educate everyone on the importance of dealing with this disease with the utmost respect it deserves. 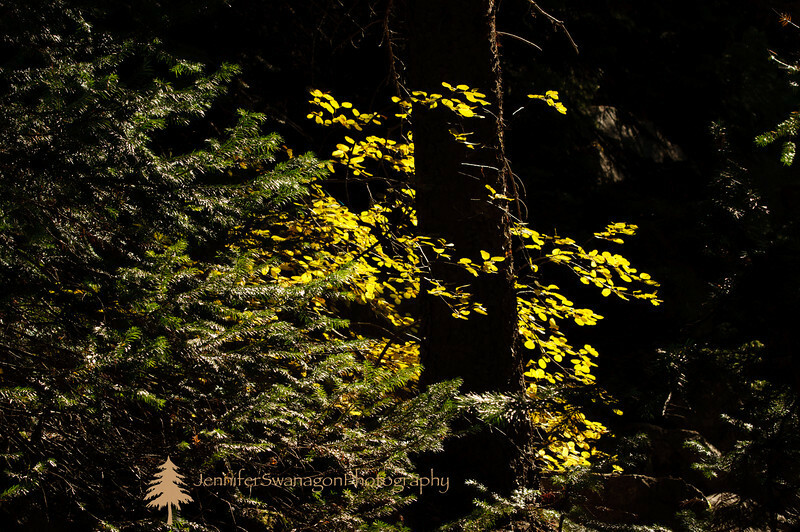 This image moves me with its contrast of light and shadows, and I found it appropriate to use today. It is important to have values in life and periodically it is essential to take a look at what it is that is valued to see if it is still true. Values change and develop over the course of a life. What I valued as a child is much different than what I hold as values now. Yet some of my childhood values are still with me. A life can be well lived when values are the mile markers on the road of life. Successful companies have value statements that hold the core principles by which business is done. As a member of society one can make important choices based on what is valued such as choice of a spouse, friendships, a place of worship and or faith, a place to shop or live. Where one chooses to spend money can be based on values. This is an image taken on a favored hike. I spotted the beauty in this beaver pond despite the buzzing mosquitoes and marshy soil. 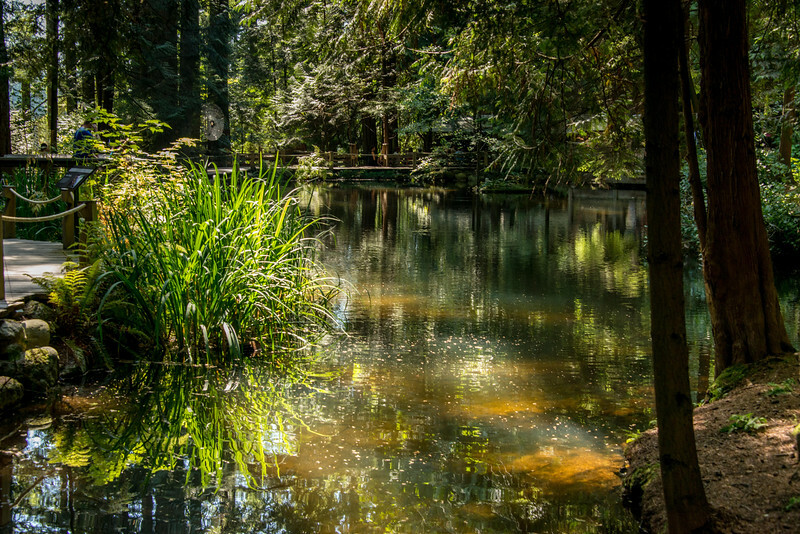 This image portrays beauty, clean air, water, presence of life, and tranquility. All of which are important values in life. I am grateful for the values that guide my life. I am grateful to be a part of a church that lives this philosophy. Here at Evergreen Lutheran Church people are active in their service to the community and the world. One example of this takes place the first week of August. For 23 years members work together in the Grove Sale, a community outreach project benefiting those in the mountain communities in need. Members donate their second hand treasures and volunteer all week long to sort, price, arrange and organize goods and then on Saturday, cashier, monitor and assist the shoppers. Since 1992 our church has given all the proceeds from the sale to the organizations in our area that support people in need. This amount has totaled $450,000. This is one example going the extra mile. Each one of us has opportunities to go the extra mile in our own life. Whether it is for family, friends or in service to the community there is always a need. The feeling this brings is fulfilling and gratifying. In this image only a few of the one hundred volunteers are depicted. Each and every person who helped this week was appreciated and felt gratified to be a part of this wonderful event. Each day a lovely meal was served at noon for the hungry volunteers and these talented cooks had just as much fun as anyone while doing their part to go the extra mile. I take issue with Mr. Dyer’s quote as it was crowded this week along the extra mile. The road is paved with good intentions isn’t it? If there was a dollar for every intention that was mine there would be a large pile of money sitting somewhere. Intention though when seen to its end is powerful. There is a wonderful book by Wayne Dyer, The Power of Intention, that provides a new take on this interesting idea, intention. Intention can be the driving force in life and can make the difference in a well-lived life and one that is only lived. Everything around us comes from intention. The flower you see today grew from a seed with the sole intention of becoming that flower. Things we use everyday were made with intention. Now think about your day. Have you thought what your intention is for today? It can make all the difference if care is given to the day ahead. One intention that could make the difference in life is simple. When there is a choice to be right or to be kind, choose that which brings peace. Wouldn’t it be wonderful if that was the intention of everyone? 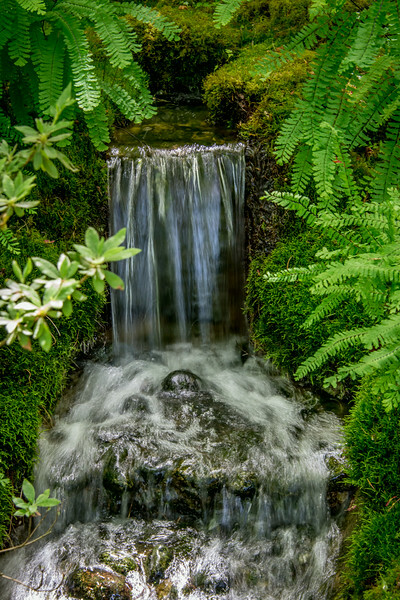 This image was taken at the lovely Butchart Gardens and this beautiful place that millions visit each year all came from the intention of Jennie Butchart when her husband’s quarry became exhausted of the lime deposits that were used in the demand for the making of cement. She stepped in and turned the gigantic pit into the Sunken Gardens by bringing in top soil by horse and cart from nearby farms. This was the beginning of a legacy all from one woman’s intention to replace an industrial part of her land into something beautiful for all people to enjoy. That is the power of intention. Flowers add so much beauty and passion to life. They are used in almost endless ways. The colors, aroma, shape and parts of flowers combine for such quiet, fragile strength and attractiveness. If one looks closely at a flower the intricate parts do seem miraculous. It is a joy to see flowers growing outside in the spring and summer. People who master this fine art of growing flowers are truly gifted. I know two people whose touch created gorgeous gardens. To walk among one of their gardens is to see a quiet side of life brimming with activity. Bees and butterflies busy at their work of pollination and flowers in all their stages slowly reaching for the light of day. I admire the excellent handiwork of the hands that skillfully create such displays of beauty. This image was taken in my friend Kathy’s backyard. 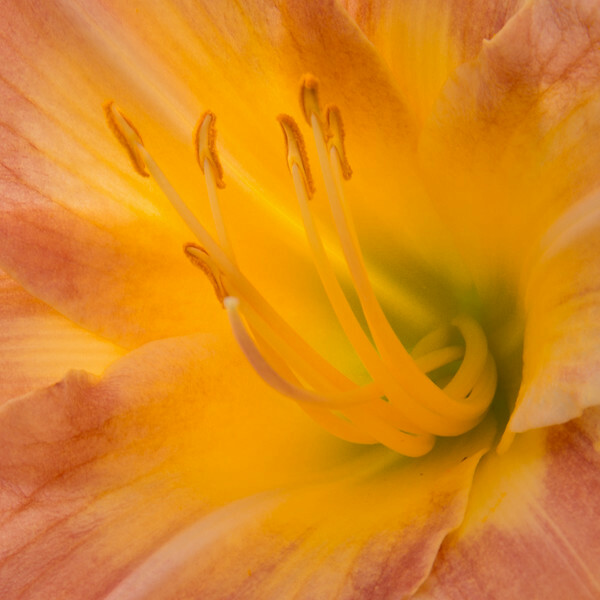 Kathy is not only talented in her flower garden, but she is an accomplished photographer and her images of flowers are exceptional. What a completely rewarding pastime it must be to create such gorgeous harmony and then record this beauty in striking photos. I am grateful for gardeners that provide this silent symphony of striking colors. The majority of us have the gift of listening or hearing, but it is the minority that actually use this gift well. It is a gift to know someone who is a good listener. They model thoughtfulness, patience, interest, and unselfishness. Listening is an art. Sometimes when a friend shares something, they might not want an opinion, but just to get it off their chest is a step towards healing or opening up. Listening to self is essential which calls for slowing down, having awareness and noticing that feeling or thought that will not leave. Intuition is with us if we pay attention and listen; notice what our mind or heart is telling us to do or not do. It is up to us to follow that guidance. Our girl is a wonderful listener. She loves for us to talk with her. She just searches our eyes as we talk and truly tries to understand everything we are saying. She senses our needs. She is also visual communicator. We learned early to pay attention to what she was telling us by watching her body language and especially her eyes. She will sit nearby and give us a penetrating stare when she needs something. She will not bark for her needs as she finds staring to be her way of communicating. She has trained us to be good listeners for her. I am grateful for the gift of listening in others and will strive to make this a gift of mine. 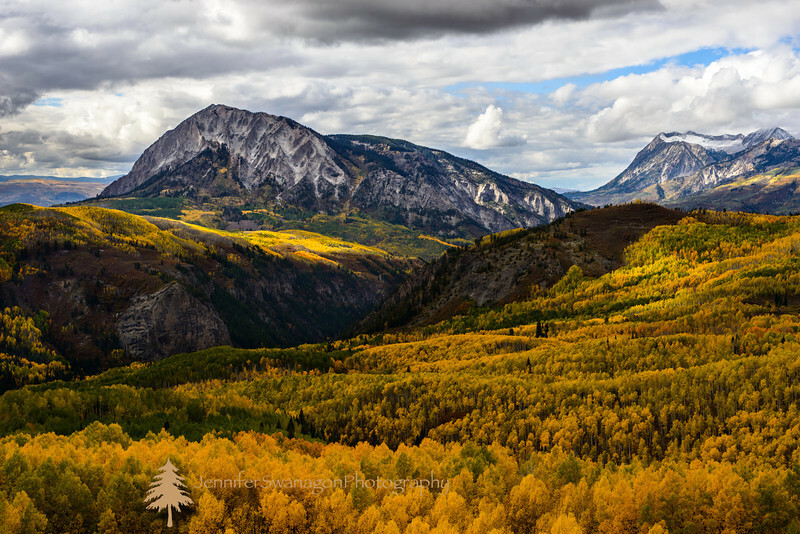 Have you noticed the lovely colors in nature whether in a backyard, along a roadside, or on a mountainside? The colors from now until fall are brilliant and deserve a second look. For those areas that have not had the plentiful rainfall this spring and summer this is not the case. And that is unfortunate. This is a beautiful and colorful summer in Colorado. We have been blessed with rain and milder temperatures. The hillsides are green and not brown; the fire fighters have not been on high alert like in summers past. 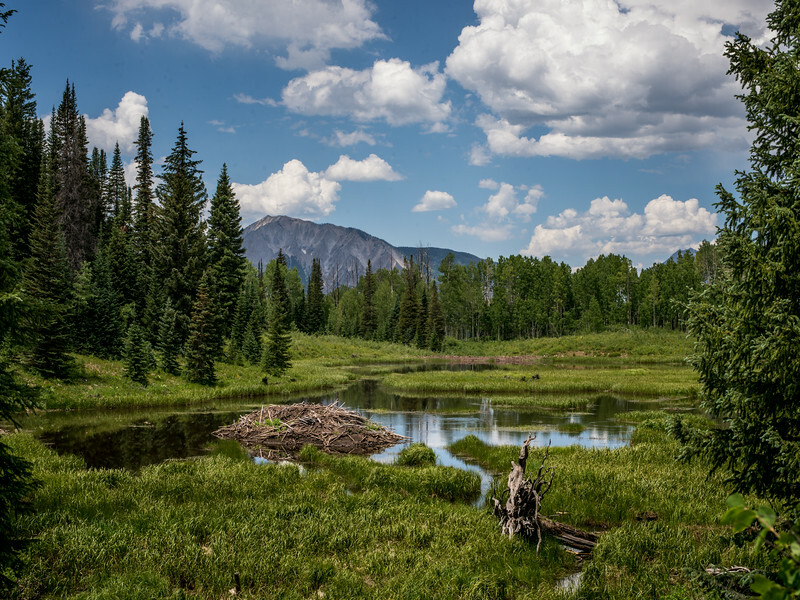 This image was taken during a hike in the mountains of Crested Butte this summer. Snow was still nearby yet these lovely flowers were doing what they do best. It is enjoyable to stop and take in the color and beauty. It will not be too long before the cold of late fall and winter draw a curtain over this colorful show and the beautiful colors of summer and fall will be a lovely memory. It is good to stop and notice these colorful gifts and give a note of thanks.